No energy efficient home would be complete without excellent insulation to help regulate temperatures and reduce heating and cooling costs. Fiberglass insulation is a great choice for any Green home. Southland Custom Homes only uses insulation installers who meet or exceed the Georgia energy codes to build an energy efficient home that meets your needs. Southland offers countless options for customization to build your dream home using materials that will save you money and protect the environment. Fiberglass insulation is designed to minimize temperature change. It is made of glass fibers that are created when glass is melted and then pulled into a very thin thread. This material is light-weight and very flexible, making it ideal for construction purposes. Fiberglass is cheap to manufacture and has become the first choice for house building. Insulation is packaged in rolls that are easily installed along the walls and ceiling of your home to help protect it from the elements. The main benefits of using fiberglass insulation are the low costs and energy efficiency. 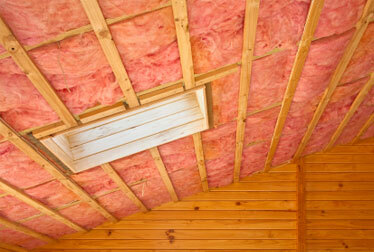 Fiberglass insulation is an inexpensive option that allows you to use less energy to heat and cool your home. In addition to reducing costs, efficient insulation also reduces the amount of fossil fuel combustion used to maintain the temperature of your home. Reducing the burning of fossil fuels results in less carbon dioxide released into the atmosphere. Not only is it environmentally friendly, fiberglass insulation also offers several other benefits for the homeowner. First, fiberglass will not absorb moisture, which helps to keep your home dry and well ventilated. Because it is noncorrosive, it will not deteriorate over time. It also absorbs sound and helps to block out noise from outside, allowing you to relax and enjoy the comfort of your custom home. At Southland Custom Homes, we take pride in using environmentally friendly house building materials in all of our homes. With so many custom options to choose from, we are confident that you will find the perfect solution to meet your needs. Fiberglass insulation is just one example of the many choices Southland offers for your new home. For more information about our custom green options, contact Southland Custom Homes at 1-866-56-BUILD or visit our website at www.southlandcustomhomes.com.